Cloud solutions, cybersecurity and analytics are the top technologies targeted for new and additional spending by public sector CIOs in 2018, according to a survey from Gartner, Inc. In today’s world of internet, the surge towards Cloud solutions is because the agility in business processes plays a vital role by upgrading to high-end technologies and infrastructure in a cost-effective way to win in the digital space. Cloud enables agility and the power of connecting across the globe creating an integrated environment with efficient collaboration and streamlined processes. Cloud services can be divided into four different models. Cloud storage is a service model where data is made available to the users through internet, it is maintained, managed, and backed-up remotely. Users enjoy flexible payment of monthly rate for their cloud data storage on per-consumption basis. Cloud’s (software-as-a-service) SaaS model helps different departments in using software in plug and play model from any location speeding up the processes and making data available to all the branches at one go. Using Cloud IaaS (infrastructure-as-a-service) companies can deliver data, including statistical analysis, lab data and imagery data faster adding to cost effective productivity and reduced operational costs. Cloud’s (Platform-as-a-Service) PaaS provides a platform required for the customers to develop, run, and manage applications without building and maintaining the infrastructure typically associated. Which company to choose and why? 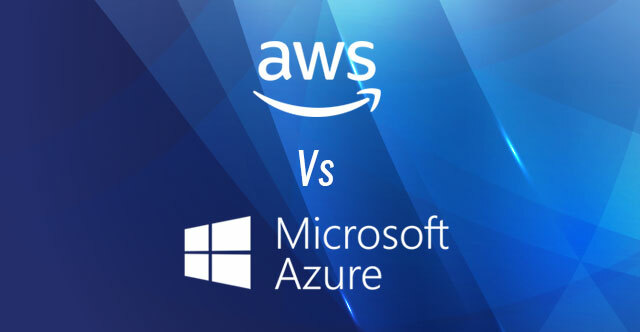 Among the list of companies that provide Cloud Services, Amazon Web Services(AWS) and Microsoft Azure are the giants in the industry. AWS has been in the game the longest and has the largest market share with 57% of the market running their apps on AWS. Microsoft Azure has 34%. 2 Storage Services Fully supports relational and NoSQL databases and Big Data. 5 Developer Tools More open source integrations available in this platform, including Jenkins and GitHub. It is also friendlier to Linux servers. Good for .net developers. Azure is catching up now with open source. AWS has certifications in ITAR, DISA, HIPAA, CJIS, FIPS, and more. Certification include ITAR, DISA, HIPAA, CJIS, FIPS. AWS offers a lot of power, flexibility, customization room with support for many third-party integrations. But there is a learning curve If it is a Windows platform, it doesn’t require learning something new. It’s simple to integrate on-premises Windows servers. 8 Licensing Pay for what you are availing, and you are provided the right customer support in terms of it if you have already paid for service, you are eligible for license mobility and do not have to pay double. AWS was first launched in 2002 and was the single player in the arena until Google’s arrival in 2009. Microsoft stepped into the arena in 2010 and is now catching up soon. So, the question is, how to choose? Is your company a non-Windows user? then AWS is the choice, as AWS is a complex and highly customizable platform that works best for companies who run non-Windows services. It is open source friendly and it offers a lot of power, flexibility and room for customization with a bit of learning curve. AWS provides IT infrastructure solutions on an as-needed basis for companies of all sizes. Prominent companies that utilize AWS include Netflix, Expedia, Hulu, Spotify, and Ubisoft. If you are an enterprise who have been dedicatedly using a variety of Microsoft products, the preference would be Azure as Microsoft’s commercial cloud business is driven by Office 365. Microsoft’s commercial cloud rollup also includes Azure; Office 365 business services (Exchange Online, SharePoint Online, Skype for Business Online, Microsoft Teams); Dynamics 365; and its Enterprise Mobility + Security Suite (EMS). Over 50 percent of the users who proffered Azure as their primary cloud provider were from large enterprises with 10,000+ employees. The reason why Microsoft can cross-sell Azure, with a foothold in terms of relationships and enterprise agreements with these larger organizations. To conclude, AWS and Azure are the two big beasts in the Cloud Services arena. So, it’s the business needs that a cloud provider fulfils and the flexibility of the business with a cloud provider that helps to decide whether it is AWS or Azure. If you need further information or assistance, we are here to help you. You can email us at info@navitas-tech.com or call us on 571-222-4646 and ask for our assistance.